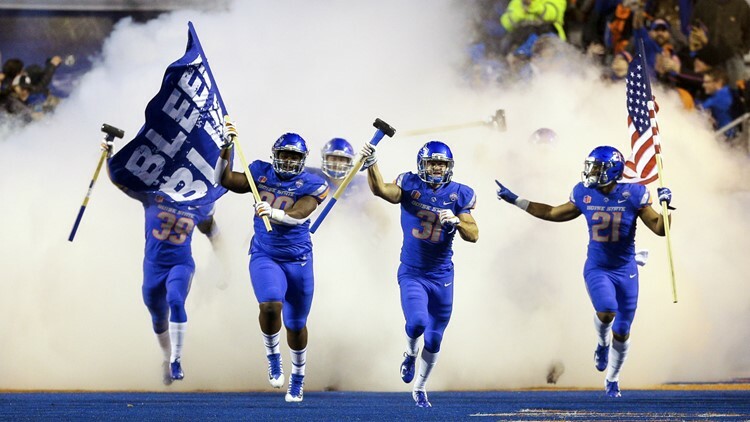 Boise State's Scale Igiehon, Skyler Seibold and Tyreque Jones lead the Broncos onto the field for the Mountain West championship game against Fresno State, Saturday, Dec. 1, 2018, in Boise, Idaho. Fresno State won 19-16. Spring football isn’t meant to settle in on a starting lineup. But it can make dents in the depth chart. Here are some names we may want to remember come August. BOISE, Idaho — Tuesday, April 9, 2019. There were several players at Boise State’s spring game Saturday who proved they’re worth a look—if not for a starting spot—at least for a meaningful role with the Broncos in 2019. The first would be quarterback Jaylon Henderson. It’s still hard to imagine Henderson being the starter, considering his limited portfolio. But he’s come so far, there could be some change-of-pace packages installed for him. Also on offense there’s tight end Tyneil Hopper. Outside of a five-yard catch by returning starter John Bates, Hopper had all the receiving numbers Saturday among tight ends, with three grabs for 20 yards. His first reception was thrown by Hank Bachmeier. You can visualize those two connecting a lot in future years. And Stefan Cobbs, who has been much discussed, is certain to be a factor at wide receiver. On defense, Tyreque Jones was a very visible guy in the spring game. The sophomore safety was all over the field, making five tackles, including a sack. Jones was credited with a forced fumble on his strip sack of Henderson, almost creating the lone turnover of the game. He also recorded a pass breakup. Jones appeared in all 13 games last season and quietly piled up 33 tackles with two breakups and a fumble recovery. The Broncos are set at the top of the depth chart with Kekoa Nawahine and DeAndre Pierce. But add Jones’ name in with proven commodities Kekaula Kaniho, Evan Tyler and Jordan Happle, and they are quite deep at safety. This was not on anyone’s radar—not even Bryan Harsin’s. But there was this surprise Harsin tweet late in the day: “Thank you @BoJackson for visiting the Broncos today! We’re extremely grateful and inspired!” Yes, that Bo Jackson. The only player ever to be named an All-Star in both Major League Baseball and the NFL, and the star of one of Nike’s most famous ad campaigns. Jackson spoke to the Bronco football team on Monday. According to Boise State, Jackson was in town for a meeting with Albertsons executives for his line of food products, Bo Jackson Signature Foods. I wondered if guys born at the end of the 20th century would even know who Bo Jackson was. Well, here’s a tweet from Bronco cornerback Marques Evans: “Just met The Greatest Athlete of all time.” Alrightee then. Quarterback Darius-James Peterson was College of Idaho’s leading rusher last year with 822 yards and 13 touchdowns. Which is fine, because DJP helped key six straight victories to end the season to give the Coyotes a second straight winning campaign. But it was a bit unnatural. Running back Nick Calzaretta was a distant second with 509 yards and just two TDs. The annual Purple & Gold Spring Game on Saturday showed a better prescription for a championship run in 2019, as Calzaretta gained 101 yards on only 11 carries. The junior from Larkspur, CA, appears poised to be the true definition of a feature back. And Peterson can spend his senior year being his ol’ dual-threat self. Nevada won’t be bringing back former coach Trent Johnson to replace Eric Musselman, newly-arrived at Arkansas. That’s because Johnson has been hired by another former Wolf Pack coach, one that used to work for him, Mark Fox at Cal. Are you following this? Fox was on Johnson’s Pack staff from 2000-04 before becoming head coach when Johnson left for Stanford. Which creates another tangled web now that Johnson is with the Bears, the Cardinal’s bitter rival. Johnson, who was born in Berkeley, played for Boise State from 1974-78. He was a bear as a player—pun intended. He was a 6-5 forward, yet he is still the fifth-leading rebounder in Bronco history. Not that we’ll do this every week, but our Former Boise Hawk of the Week has to be Seattle’s Daniel Vogelbach. Vogelbach had the best game of what has been a sporadic big league career when he went 3-for-4 with a three-run double, a two-run home run and a solo homer while driving in a career-high six runs in the Mariners’ 12-5 win over the White Sox Sunday in Chicago. Vogelbach was back at designated hitter Monday night in Kansas City. The Royals walked him three times in Seattle’s 13-5 win, but one of his other at-bats produced another homer. Vogelbach played for Boise in 2012, batting .322 with 10 home runs in 37 games. Rain is expected in Pocatello today—enough that Boise State and Idaho State have postponed their scheduled women’s softball game. The Broncos and Bengals will try again next Tuesday. Boise State is itching to get back on the field. Due to a bye weekend, the Broncos have been living with the three-game sweep they suffered at San Jose State for a week and a half. They return to Dona Larsen Park for a three-game set versus Utah State beginning Friday. Phil Mickelson wins his third major in three years—and his second Green Jacket—with a championship in the 70th edition of the Masters. That propelled him to No. 2 in the World Golf Rankings behind Tiger Woods. Mickelson has never made it to No. 1. Lefty would win the Masters a third time in 2010. He’s also been victorious in one British Open and one PGA Championship, but he has yet to win the U.S. Open.